For once the standing ovation was not only justified but it also involved myself, usually the last man sitting when the rest of the audience gets to its feet. The performance of Beethoven’s Ninth was good, but not in itself justifying the ovation, but the clue to the almost universal expression of admiration – and I saw only one section of a gallery that remained largely seated – came when the conductor came on stage alone. 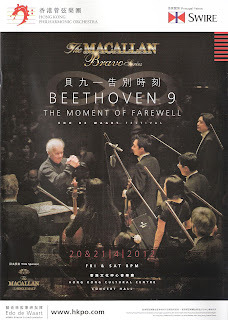 For this was Edo de Waart’s “Moment of Farewell”, as the Hong Kong Philharmonic Orchestra had so cleverly marketed it. Six calls were made at the end of the concert, and the biggest cheers were reserved to those two in which de Waart came on stage alone. I have never experienced such a send off to an outgoing Music Director in Asia before. True, much of it had been managed by the HKPO itself who ran a three week mini festival leading up to the final concert, with posters around town and a manufactured sense of climax as the "Moment of Farewell" approached. But there was real affection shown on Friday night by the audience, revealed by the great cheer that went up when he walked to the back of the stage and tossed his bouquet high into the choir – where it was caught with such a flourish one wondered whether the prospect of a Holland/China cricket test match was entirely inconceivable. The Malaysian Philharmonic Orchestra have always tried to sweep their outgoing music directors under the carpet, determined, if possible, to expunge them from history and, one suspects, really preferring to push them out of a plane at high altitude rather than allow them get the kind of reception given to de Waart. And, although my diary seems to indicate that I was there when Choo Huey made his last stand with the Singapore Symphony, I regret I can’t remember a thing about it. As Music Directorial terms of office go, Edo de Waart's eight years with the HKPO was a brief stint and would not usually generate quite such a near ecstatic response. But the transformation the orchestra has undergone in that time, not to mention the huge revival of support from the community at large, has been near miraculous. He managed to transform the climate for western classical music in Hong Kong from its post-Colonial stupor to something vibrant attracting a wide cross section of Hong Kong society. So the standing ovation signalled the Hong Kongers’ gratitude for a man who has opened up social and artistic doors for the local community and has put the city on the international music map. With that in view, any comment on the performance itself is perhaps irrelevant; this was a national celebration rather than a musical experience. But, as it happened, some things in the concert were of such outstanding musical quality, that they deserve being highlighted. The best musical thing was Susan Graham’s powerful account of Berlioz’s La Mort de Cléopâtre. So obsessed are music historians and commentators with Berlioz’s brilliance as an orchestrator, that it often gets forgotten that he was one of the most original and compelling composers for the human voice. In fact his output for human voice far outweighs anything he wrote for purely instrumental forces, and while I am not entirely sure he was all that sympathetic to singers, he loved words and in his desire to express words in music he produced some astonishing things. The trouble is Berlioz’s desire to convey words often exceeded the realities of singers’ limitations and even today, when singers are clearly far more flexible and adaptable than they were in the 19th century, few really can interpret Berlioz effectively. Susan Graham proved to be one who could, delivering the words of Pierre-Ange Vieillard about the grisly death of the ancient Egyptian queen with such drama that there were times when the blood froze. As she evoked Cleopatra's death throes, almost in a whisper, it seemed as if she was on the very point of taking out a snake and afixing it to her bosom – certainly her dress accentuated that part of her anatomy with its large cups looking tantalisingly as if they were readily detachable should a passing viper slither by. But we didn’t need visual stimuli to get the picture. The simple extended sibilant of her final “Cesar!” hissed with an almost snake-like venom, was all we needed to get the full horror of the picture. It was a tremendous performance and stands alongside the unforgettable moment when, back in 1989 at the opening of the Cultural Centre, Jessye Norman held the audience in the palm of her hand with an unaccompanied encore of “Amazing Grace” sung pianissimo. You could have heard a pin drop then, and you certainly could have heard another on Friday, for the audience was on its best behaviour. Not a cough, not a rustle of paper, not a little blue screen as a bored executive checked his emails, and not even the usual mass exodus as soon as the final double bar appeared over the horizon. All this added to the sense of occasion, and while the orchestra itself was not, perhaps, at the top of its form in the Beethoven, this was a highly charged performance which reached a true climax in the finale when the Shanghai Opera House Chorus did their bit. This was superb choral singing with an excellent balance and a real sense of commitment. Mark Schnaible delivered the bass admonitions with magisterial authority, while Henry Choo and Lisa Larsson managed Beethoven’s often unpleasantly high tessitura with grace and assurance. 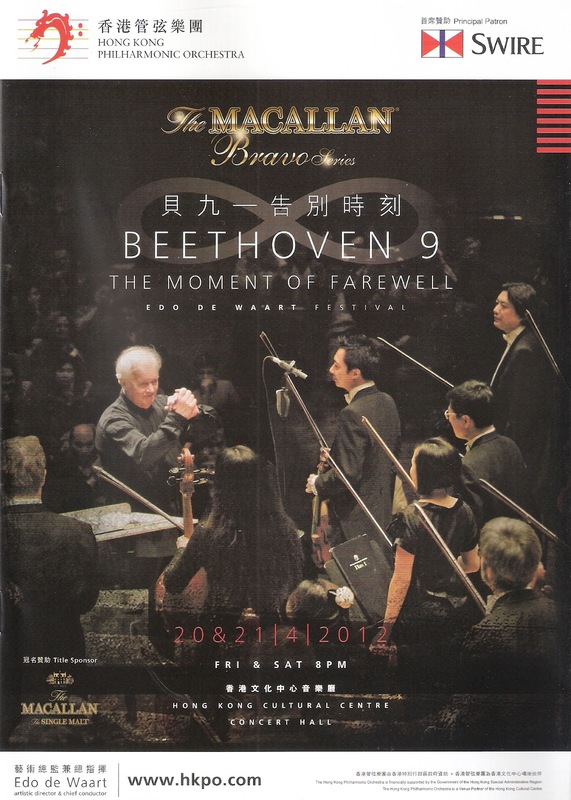 Friday's concert was not quite “The Moment of Farewell”, since it was repeated on Saturday. My only hope is that, second time around, the people managing the stage lights would have sobered up. As the chorus got to its feet at the start of the Beethoven finale a sudden burst of activity from the spotlights looked intiially as if the controls had been passed to those trained in searchlight duty during the Second World War scanning the sky frantically for incoming enemy aircraft. A while later and the controls were passed to someone clearly under the influence. The spotlights waved manically around, at one point shining directly into the eyes of a section of the audience, and it began to look like one of those cheap TV shows where excitement is generated by running the spotlights crazily over the audience. Were we going to get this with Beethoven’s supercharged ending to the Symphony? Luckily, someone threw a switch so that the chorus ended partially in darkness, but nothing dimmed either the magnfiicance of their fulsome singing or this dazzling sense of occasion.